Bruton Smith popped off at the mouth again Friday, not-so-coincidentally at the kickoff of his Atlanta Motor Speedway race weekend. Smith is a brilliant businessman who understands the value of free publicity. He also isn't afraid of making outlandish (some would say foolish) statements in an effort to attract that publicity. Every time NASCAR's traveling circus raises its tent at a Smith-owned speedway, media members brace for a new round of "Brutonisms," as the SMI boss offers his opinion on what's wrong with the world of NASCAR racing. And the way he sees it, there's plenty wrong. Friday, Smith put the crosshairs on Homestead-Miami Speedway; a track not-so-coincidentally owned by rival International Speedway Corporation. He said Homestead-Miami does not deserve to host NASCAR's annual season finale, and that the race should be moved to another venue; specifically Atlanta or Las Vegas. “They don’t have the seating, they don’t have parking," said Smith of the Homestead-Miami oval. "The event should be held somewhere else. If NASCAR was in a position to do the right thing for the sport -- and I would say that they’re not necessarily in that position, (and that) some of the things that they do is self-serving -- why would you have the last race of the year in some Godforsaken area that is north of Cuba? "Mr. Smith is being disrespectful, not only to the people and community of South Florida, but also to the one million Cuban Americans that make up this great community," said the writer. "His comments are no doubt fueled by his greed to get another date for his Las Vegas or Atlanta tracks. He obviously doesn’t want to sacrifice dates from any of his tracks, so what the hell, let’s start a campaign to trash South Florida. I wish Mr. Smith the best of luck in all his business endeavors, but I also warn him that South Florida will not give up our race easily." Homestead-Miami President Curtis Gray also defended his track today, reminding Smith that in addition to NASCAR’s Ford Championship Weekend, the South Florida oval also hosts season finales for the Grand-Am Rolex Sports Car Series and the IndyCar Series. For the record, Bruton Smith is well aware that Homestead-Miami Speedway's Sprint Cup finale has become an annual grandstand sellout. He knows that the track has become one of he more competitive venues on the circuit since ISC rebuilt it (for the second time) a few years ago. He also knows that ISC's France Family is not about to hand him the final race of the season, just because he wants it. This is, after all, the same Bruton Smith who annually lobbies fans to "tell NASCAR that you want a second race at Las Vegas Motor Speedway," knowing that he could make that race happen before lunchtime, if he really wanted to do so. 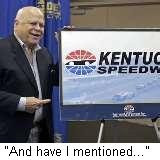 This is the same Bruton Smith who blusters endlessly about Kentucky Speedway deserving a Sprint Cup race in 2010, while keeping the only man standing in the way of that race -- former owner Jerry Carroll -- on the dole as a paid consultant. 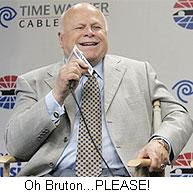 This is the same Bruton Smith who bellows about moving the NASCAR finale to Atlanta, while ignoring the fact that yesterday's race there featured a 125,000-seat grandstand filled with approximately 94,000 fans. Maybe I'm biased. After all, I am employed by MRN Radio, which is owned by International Speedway Corporation. Or perhaps I simply recognize meaningless, Barnum-and-Bailey hucksterism when I hear it, over and over again.